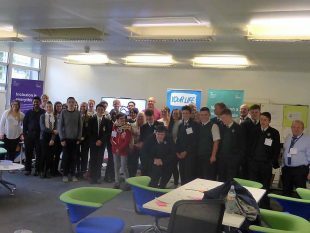 Last week we held a Science, Technology, Engineering and Maths (STEM) event for pupils from two local secondary schools, at our digital hub in Newcastle. 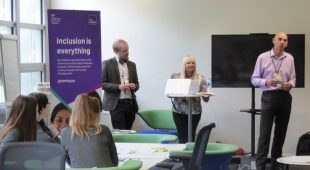 The aim of the day – which was held in partnership with MyKindaFuture and Capgemini – was to help change young people’s perceptions about working in technology, and encourage them to think about the opportunities unlocked by studying STEM subjects. These subjects are so important because they touch every aspect of our lives, including the services we deliver for the public. Keith Dickson, Head of Universal Credit Live Service Digital Delivery, opened the event by asking for a show of hands from pupils who were interested in working in the digital sector in future. With only two raised hands out of 24, we knew we had our work cut out! Joe Harvey, one of our scrum-masters, ran one of the day’s hands-on sessions – the marshmallow challenge. 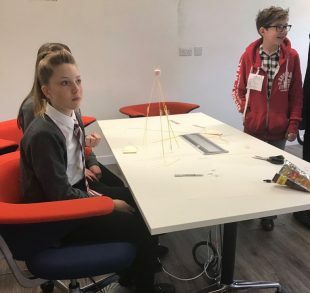 It involved the pupils working as a team to construct the tallest freestanding structure using only spaghetti, tape, string and a single marshmallow. Joe explained, “The challenge gives a great introduction to agile principles – which is one of the ways we develop our digital services in DWP. It shows how working in a team to approach a problem with limited materials and with limited time encourages innovation, creativity, collaboration and the value of early prototyping. 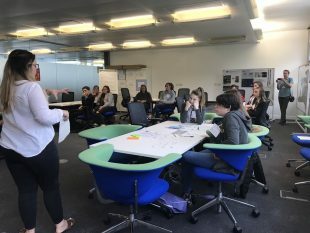 Then it was onto a session with James Peart, another of our scrum-masters, which aimed to show the broad range of different roles available in digital technology and prove that it’s not just all about coding. I’m so happy with the way the day went. The pupils were really enthusiastic and engaged with both of the tasks. And they were genuinely interested in the career options available both in the digital sector and the Civil Service. At the end of the day, when we asked again who was interested in a digital career, pretty much everyone in the room put up their hand. And what’s really heart-warming is that lots of new friendships between the two schools were formed that day. Studying STEM subjects is indeed important as they help the future generation solve tomorrow’s problems. I think it’s fantastic that we’ve got this opportunity to open these students’ eyes to career paths they might not have ordinarily considered. And I’m delighted that we’ve been invited to one of the school’s careers fayres later this month to promote digital career options to the rest of the school.